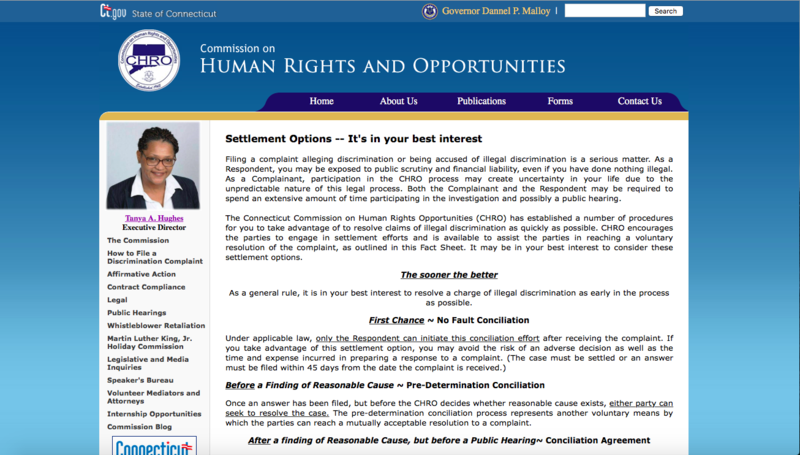 In its administrative report to the governor, the Commission on Human Rights and Opportunities, which is tasked with investigating claims of discrimination in employment and housing, claimed that it had “the best production rate” of any similar agency by securing $10,250,000 in discrimination settlements from employers and property owners during FY16. Of the 2,793 claims closed in the past year, 1,293 resulted in some form of settlement, either during mediation or in court, according to the figures released by CHRO. This results in an average settlement of $7,927.30. But some employers and property owners liken the CHRO’s practices to “extortion” and claim they are forced to settle with claimants to avoid a longer and more costly fight. The commission came under fire for touting their settlement numbers earlier in the year during a public hearing before the Legislative Program Review and Investigations Committee. The review and investigations committee recommended eliminating the use of settlement funds as a metric for measuring the CHRO’s success in their findings report issued on December 7. The CHRO agreed with the recommendation. The report comes as the number of discrimination complaints made to the CHRO continues to rise. Since 2012 claims of discrimination based on a number of different categories including gender, race, age, criminal background and sexual orientation have increased 42 percent. Most notable was a 76 percent increase in housing discrimination complaints and a 38 percent increase in accusations of discrimination in employment since 2012. The case assessment review occurs at the initiation of a complaint. The commission decides whether or not a case is able to move forward to mandatory mediation. During mandatory mediations a mediator is assigned to the case and tries to a settlement agreement between the two parties to avoid moving on to the investigative stage.